Among its leading projects, the MMLC hosts a significant research and educational archive, designed and curated by MMLC Director Janine Spencer. Sponsored by the National Endowment for the Humanities, the Florence Gould Foundation and the Alumnae Association of Northwestern University, the documents in this digital archive invite the visitor to explore the Picpus Cemetery in Paris and examine the nature of commemorative monuments. The Archive is an educational resource open to educators, students and researchers worldwide. 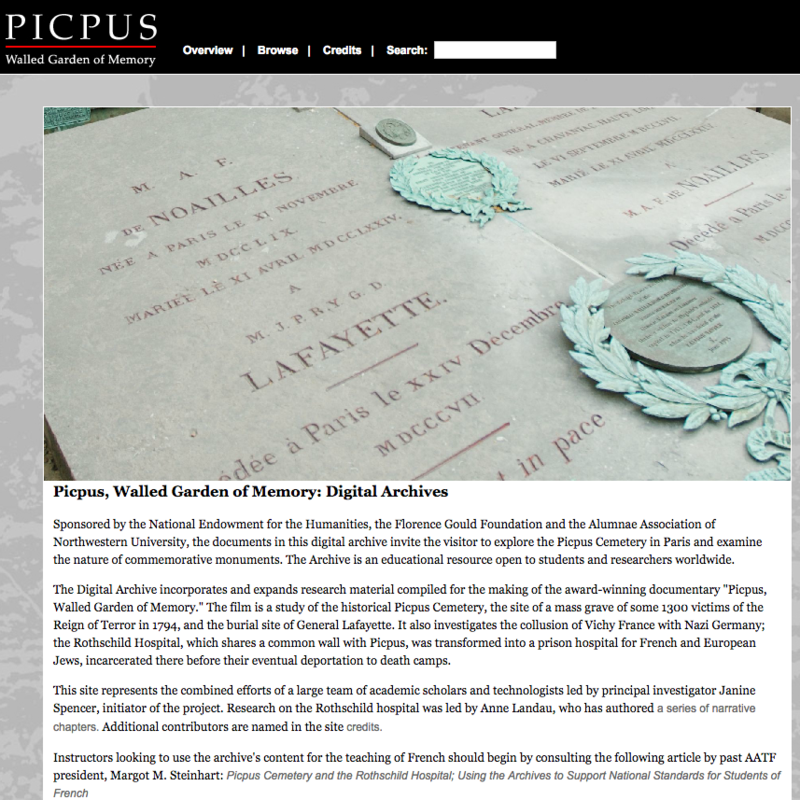 The Digital Archive incorporates and expands research material compiled for the making of the award-winning documentary “Picpus, Walled Garden of Memory.” The film is a study of the historical Picpus Cemetery, the site of a mass grave of some 1300 victims of the Reign of Terror in 1794, and the burial site of General Lafayette. It also investigates the collusion of Vichy France with Nazi Germany; the Rothschild Hospital, which shares a common wall with Picpus, was transformed into a prison hospital for French and European Jews, incarcerated there before their eventual deportation to death camps. In addition to primary source documents from public and private archives, the site contains 27 hours of original videos of interviews of scholars and witnesses who share their knowledge or personal experiences with the viewer. All interviews are transcribed into French and translated into English. Access to translations and transcriptions is optional. This feature adds value to the educational purpose of the Archive as it provides vast opportunities to the intermediate or advanced level language learners to increase their listening comprehension skills while being engaged in a rich cultural quest.